The Chief Minister of Mnaipur, N Biren Singh has been chosen as the 3rd best Chief Minister among the Chief Ministers of 23 states of the country according to a nation-wide survey by India Today. N Biren Singh is gaining popularity all over the nation as evidenced by this Survey by India Today recent chief minister which placed him as the 3rd most popular chief minister in the country. He bagged 52% votes in the survey to emerge as third most popular Chief Ministers in the country. India Today survey said Naveen Patnaik is the most popular Chief Minister in the country with 59% people voted for him followed by West Bengal Chief Minister Mamata Banarjee with 53% respondents in West Bengal have thrown their weight behind her to be their next CM. According to the survey by India Today’s Political Stock Exchange (PSE), based on telephonic interviews across 21 parliamentary constituencies in Odisha, about 59 per cent of the respondents wanted Naveen Patnaik to be the Chief Minister again. 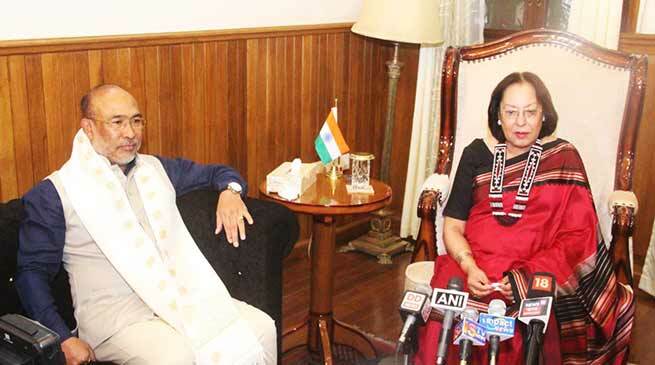 Manipur Governor Dr Najma Heptulla felicitated N Biren Singh at a small gathering held at Raj Bhavan, Imphal on October 15.